David was a shepherd. A shepherd is one who takes care of sheep. David watched over his sheep protecting them from wild animals. Sheep are not smart animals so they need a shepherd to take care of them. The shepherd leads them to green pastures to graze and directs them to drink sweet clean water. David made sure they had good grass to eat and clean water to drink. He also sang to them. He played his harp and made up praise songs to the Lord. The sheep were lucky because they got to listen to the songs. When he was not playing and singing he practiced his sling shot. A sling shot is a tool that a shepherd can use to protect his sheep and direct them to go the right way. When a shepherd shoots a rock right behind sheep it can cause them to run the way he wants. A shepherd can use a sling shot on a lion or bear which can chase or kill it. David practiced using his sling shot until he was skilled and his aim was good. He also carried a club that he practiced using. 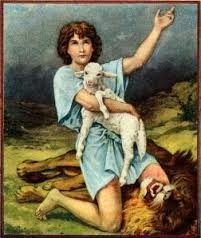 David caught sight of a bear which had snuck into the flock of sheep and grabbed one in its strong jaws. 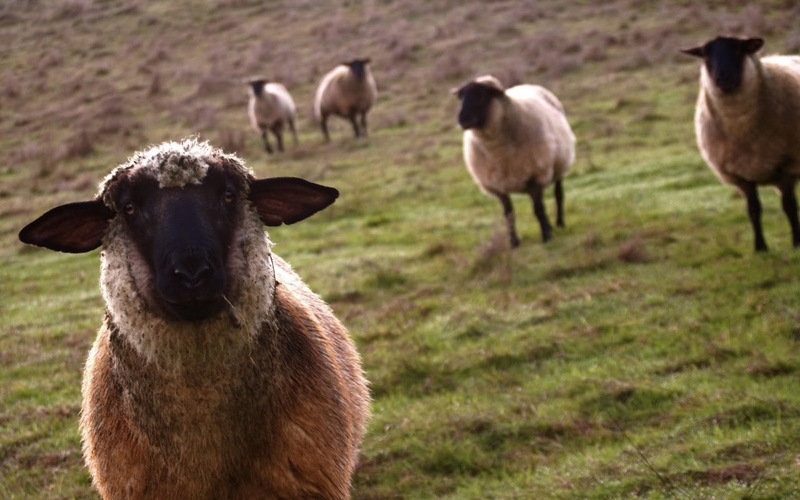 David rushed after the bear and using a club he carried, killed it and saved the sheep’s life. Another time a lion ran and snatched a lamb in its mouth. David did the same thing. This happened many times. God helped him kill the bears and lions which took his sheep. He practiced using his sling shot and was not afraid of chasing and killing a wild beast. David showed great determination. Determination means quality of resolute and firmness of purpose. He had a job to do and he wanted to do it to the best of his ability. He made sure he was strong, brave, and had skill in using weapons to take care of them. David had seven brothers. Three of his oldest brothers were off fighting in the Israelite army against the Philistine army. David’s father wanted to know how his sons fared and get news from the battle. He told David to take some food for them and find out how they were faring. David left first thing the next morning. David arrived in the Israel camp and he found his brothers. As they talked, he heard someone shouting. The man in anger provoked anyone to fight him. His voice sounded ferocious and scary. All the men in the Israel army were frightened by this man with the thunderous nasty voice. David got closer and saw him. He looked like a giant. The Philistine army called Goliath their champion. 1 Samuel 17: 4-11 says: And a champion went out from the camp of the Philistines, named Goliath, from Gath, whose height was six cubits and a span. 5 He had a bronze helmet on his head, and he was armed with a coat of mail, and the weight of the coat was five thousand shekels of bronze. 6 And he had bronze armor on his legs and a bronze javelin between his shoulders. 7 Now the staff of his spear was like a weaver’s beam, and his iron spearhead weighed six hundred shekels; and a shield-bearer went before him. 8 Then he stood and cried out to the armies of Israel, and said to them, “Why have you come out to line up for battle? Am I not a Philistine, and you the servants of Saul? Choose a man for yourselves, and let him come down to me. 9 If he is able to fight with me and kill me, then we will be your servants. But if I prevail against him and kill him, then you shall be our servants and serve us.” 10 And the Philistine said, “I defy the armies of Israel this day; give me a man, that we may fight together.” 11 When Saul and all Israel heard these words of the Philistine, they were dismayed and greatly afraid. He was huge! No one had the guts to fight him. David understood someone should, and though the youngest and had never fought in an army before, he believed God would help him kill this ferocious man. King Saul found out David asked many questions about the giant. Saul asked for David. David came to Saul’s tent. 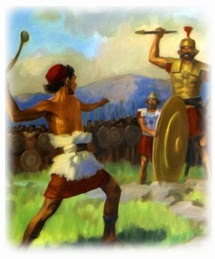 Saul didn’t think David capable of killing the giant Goliath, but he gave him his own armor for protection. David tried it on and took a few steps. Right away he took the armor off. David took his trusty sling shot instead of King Saul's sword and armor. 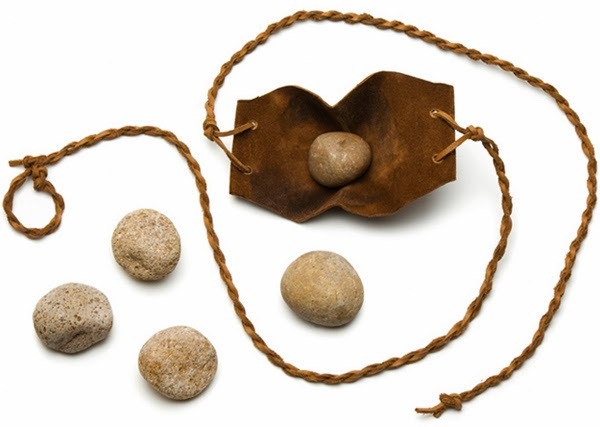 He hurried to the brook and gathered five smooth stones which he placed into his pouch. David ran out to meet Goliath face to face. David ran at Goliath with a stone in his slingshot. 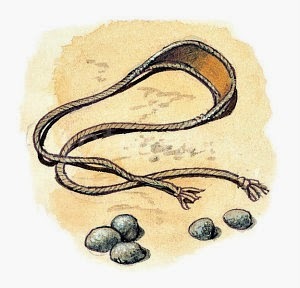 He whipped the sling shot around his head gaining speed and let the stone fly. The stone sailed through the air hitting Goliath right in the middle of his forehead. Goliath landed with a thunderous crash. David ran up and grabbed Goliath’s sword and cut off his head. As soon as the Philistine army witnessed their champion die, they ran away. 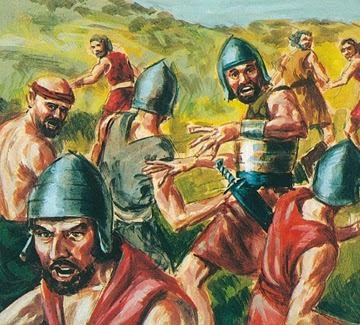 The Israelite army chased them and conquering the whole army. David’s dedication and determination helped him kill Goliath. He practiced his skill with the slingshot. He determined to trust the Lord. He determined to kill Goliath. David’s faith in the Lord got him through the fight. God directed the stone to land in the exact unprotected place to knock him down unconscious. David is a great example of good qualities to have. He demonstrated courage, faith, and determination. Do you show courage? Do you have faith in the Lord? Are you determined to do your best in whatever you are asked to do? Do you practice your skills? Being determined is a great quality to have. You can demonstrate determination in many ways. In your schoolwork, chores, sports, music, and in obedience you can determine to do your best in all of those areas in your life. Memorize: 1 Samuel 17:45 Then David said to the Philistine, “You come to me with a sword, with a spear, and with a javelin. But I come to you in the name of the Lord of hosts, the God of the armies of Israel, whom you have defied.